In this Feb. 28, 2018 photo, President Donald Trump pauses during a meeting in the Cabinet Room of the White House, in Washington. The U.S. special counsel in the Russian election meddling investigation has learned of two conversations in which President Donald Trump asked witnesses about matters discussed with investigators, the New York Times reported Wednesday. 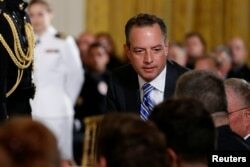 White House Chief of Staff Reince Priebus takes his seat for a ceremony recognizing the first responders to the June 14 shooting involving Congressman Steve Scalise, at the White House in Washington, U.S. July 27, 2017.